An Urban Land Institute report predicts that across the nation, 8,000 members of the Baby Boom generation will turn 65 every day for the rest of the decade. Communities with such features as a mix of uses accessible to those who don’t drive; physical and social activities; amenities such as parks and safe streets; and a mix of appropriate and affordable housing options, are places where older residents can thrive. However, many communities in New Jersey, which has the 10th largest number of residents age 60 and older in the nation, fail to offer these attributes. Palmer Square in Princeton. The town is the first in New Jersey to receive the World Health Organization’s Age-Friendly designation. Where do older residents want to live? According to surveys, most people want to stay in their communities as they get older. It’s where their social connections, medical professionals, houses of worship, and other resources and amenities are. Some people want to stay in the same house they’ve been in since they moved to the community; others may want to move to a different residence in the same town. What do older residents need? As people age, their mobility needs change. Many people will eventually reduce their driving, or stop altogether, making the ability to get to various destinations without a car very important. That means putting these destinations in close proximity to each other, and within easy walking or cycling reach of local residents. Some people may choose to move — from a larger single-family home to a smaller house, townhouse or apartment, closer to all the destinations they need to reach, and perhaps easier to navigate and maintain. How prepared are New Jersey communities to meet this need? 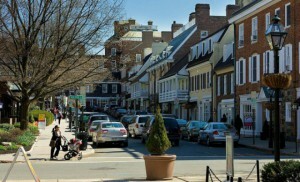 New Jersey Future has scored every municipality on three criteria that together serve as a general indicator of how well a town is positioned to meet these changing needs — whether it has a recognizable downtown or Main Street with a variety of establishments; how many typical destinations there are per square mile; and how connected the street network is. A greater number and variety of destinations per square mile makes it easier for people to accomplish daily tasks efficiently, and a well connected street network makes it easier to reach these destinations by means other than cars. Unfortunately, the places in New Jersey where the largest numbers of older residents live are not places well positioned to meet their changing mobility needs. In New Jersey, almost 300,000 people aged 55 and older, or approximately 13 percent of all older residents in New Jersey, live in areas that scored low on all four aging-friendliness indicators. This means these residents are more dependent on a vehicle to accomplish daily tasks. The number of people who are set to grow older in car-dependent communities is projected to rise, bringing with it greater demand for transportation services and risk of greater social isolation as a result of reduced mobility. A large number of New Jersey’s older residents are also housing cost-burdened, which means they are paying more than 30 percent of their income for their housing. This happens for a variety of reasons: Retirement income tends to be lower than employment income while housing costs typically stay the same or rise, and a low number of the kinds of homes older people want — townhouses or apartments within walking distance of daily tasks — makes the existing supply expensive. This means older residents who would like to move to different — perhaps less expensive and more accommodating — housing cannot afford to. Ways to modify land use regulations to support age-friendly development. For more information on New Jersey Future’s work in helping to create great aging-friendly places, please contact Planning Manager David Kutner. Resources developed as part of New Jersey Future’s work with several municipalities on Creating Great Places To Age were featured at the American Planning Association’s annual National Planning Conference in April. Two recent articles highlight the difficulties many New Jersey towns have in making themselves accommodating to older residents. Princeton has earned the World Health Organization’s age-friendly communities designation, the first municipality in New Jersey to receive the honor.